Rabbits make great pets. They have character, are intelligent, enjoy the company of humans and are a great way of introducing responsible young children to pet ownership. They are quiet, clean and are easily toilet-trained. But they must be carefully looked after. While rabbits love company, they can be left alone during the day and are therefore suitable for people who work or are away from home. A predator-proof enclosure to ensure their safety is essential. An appropriate enclosure is a large-enough hutch that is divided into two connecting compartments, one with wire mesh top and sides to allow access to natural light and fresh air, while the other is enclosed to provide a 'bolthole', protection against threats, weather and which can be a secure sleeping place. The floor of your rabbit's hutch should be covered with newspaper, with a layer of bedding material like straw, grass, hay or shredded paper for warmth, comfort and to prevent pressure sores on your bunny’s hind legs. Consider extreme weather conditions and ventilation when choosing a location for your hutch. Rabbits are extremely sensitive to the hot summer temperatures we experience in Australia and may die of heat stroke if their hutch is not in a cool, shady position. Or if they are not adequately cooled in hot weather. Grass seeds can become stuck in their eyes, ears and nose, causing irritation or even infection. Check your rabbit’s rear end to make sure it is clean and dry, because if soiled, it's prone to fly strike. Using a firm brush to remove dead hairs, tangles and pieces of garden matter should form part of the routine. Feeding is the most important factor in making sure your rabbit stays healthy. 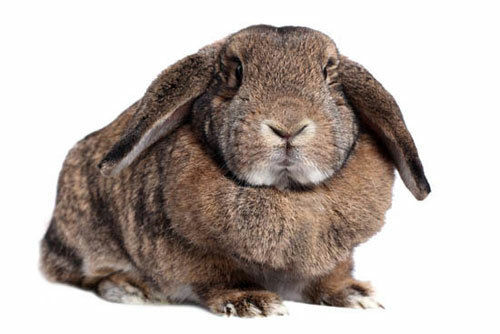 Many commercial rabbit foods don't contain enough fibre (18 - 20% is required) and are too high in fats and sugars. Rabbits are herbivores so their diet should consist almost entirely of vegetable matter. Grass and/or hay is an essential dietary component. Apart from providing a high-fibre diet, chewing hay wears down their continuously-growing teeth and keeps rabbits occupied, preventing boredom. Ideally, feed your bunny about 85% hay and 15% veggies, such as Asian greens, celery leaves, carrot tops (not the carrot itself) or parsley. Check which vegetables are suitable, because many are not. For example, green lettuce and cabbage can cause diarrhoea. Treats such as fruits, root veggies (carrots), capsicum and pellets should only be offered in small amounts (1-2 tablespoons per day per rabbit). Fresh water must always be available using both a drip feed bottle and an open container. Veterinary care for rabbits includes vaccination against Rabbit Calicivirus (a fatal disease) and desexing. Rabbit Calicivirus vaccination is essential. Rabbit Calicivirus is always fatal. It's spread by mosquitoes and by contact with infected rabbits, and infected food and other material. The virus is routinely released into the environment by local councils as a way of controlling the feral rabbit population. This presents a clear danger to pet rabbits, who may catch the disease from mosquitoes or from other sources. Please make sure your pet rabbit is up-to-date with the Rabbit Calicivirus vaccination every 6 months to ensure protection against this deadly disease. Desexing is strongly advised. Female rabbits who are not desexed have a very high likelihood of developing uterine cancer as they age. Rabbits of both sexes may at times become aggressive if not desexed. And of course, rabbits can breed easily unless desexed. Like all animals, rabbits should have regular veterinary checks, including checking their teeth and claws, as well as ensuring that they're up-to-date with vaccination against Rabbit Calicivirus. We welcome you to book an appointment with us to check your rabbit's health and vaccination status, and to discuss how best to look after your rabbit.